We had 2 trips today, I took out Mike and Danny took out Clarke and his friends. We both started out looking for topwater action. About 6 I found a large school busting in about an acre of water. We popped a few punks out of it although I kept looking at the depth finder and seeing nice fish below the breaking fish. The punks were fun to play with but we soon realized the nicer fish were not feeding on top. We trolled around and caught a few more but lost the primary school. We relocated another school nearby and called Danny in and we started putting fish in the boat. We worked them for an hour and moved on. Danny located two more schools that both boats worked catching fish all morning. 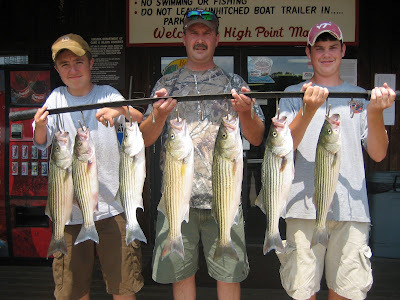 We all came in at 11, catching 50 fish between the 2 boats and everyone taking home a few Stripers for the table. We also had a friend out fishing with live bait today, Earl Motorman Mielke, that we called to numerous schools we found to see if the Stripers would hit the live bait. He didn't loose a fish today. He never got Bit!